Say G'Day Saturday Linky Party ~ Christmas Tablescapes! Hello dear friends! I'm so happy that you have dropped by to visit me in my little corner of the world Down Under today. I hope you have all been enjoying the first week of December. We have had a great week so far as my kids are now on Summer vacation! We have been baking, relaxing and catching up with our family. I have also been having lots of fun decorating our kitchen and dining room for Christmas! I have nearly finished decorating but I am not quite sure what to do for our Christmas table. What do you think about these Christmas Tablescape ideas? What do you think of my Pinterest inspired Christmas tablescape? I am quite happy with this Christmas tablescape. I bought nothing new, used what I already had and still managed to make it feel festive and Christmassy! Christmas Say G'Day Saturday Linky Party! If you would like to link up a post, old or new, about your Christmas decorating, Christmas planning, Christmas recipesor anything else Christmasy to my Say G'Day Saturday Party, just add the url of your particular blog post that you would like us to visit to the Linky tool below. If you would like some more Christmas inspiration, please come and visit me at my Christmas blog. I am in the middle of my 12 Days of Christmas Traditions series at the moment and so far I have posted about Christmas Puddings, Christmas Stockings, Christmas around the world, Gingerbread Houses and Candy Canes! I will also be hosting a Christmas party over there on December 12 so please be sure to join in then! Thank you so very much for stopping by today. As always, your visit means so much to me. So much inspiration here--love all the ideas. I think your Christmas beverage center is adorable. You have saved me so much time by posting these lovely images. Only problem is I like so many of them it's difficult to just go for one look. Maybe I'll take your lead and just go with what I have and mix and match. I like your tablescape, your blue plates are beautiful! Thanks for hosting this party every week! Even though I don't always link up I appreciate all the work you do! Love your Christmas decorating and tablescapes, and SNAP - I have the same linen and oak French chairs as you - Stylish Natasha!!!! I love your tablescape, not overdone - just elegant. Happy decorating. Hi Natasha. I love your Christmas tablescape at the end. It looks lovely - you've done so well with it. I really love all your decorating as well. I love all the little Santas, and you've given me a real idea with those baubles on the cake stand. I have several vintage cake stands that we bought for my daughter's wedding in the summer, so I can now use them for displaying Christmas baubles. Brilliant! You are very artistic in the way you arrange everything around your home. I would just like to thank you also for your lovely comment on my allergy post, and your virtual hug made me feel much better!! Take care my friend. I just wanted to say thank you for your birthday message and the afternoon tea that you hosted for me today. The cupcakes you made were delicious! Beautiful post! So many pretty images. I love your layered tray of pink ornaments and the flowers! Gorgeous! Thanks so much for having your linky party so sweet of you. I love all the photos of the Beautiful Tablescapes!! I love the way you have put yours together for the Christmas Holiday's, and your dishes are gorgeous sweet lady. I hope you and your family have a wonderful Christmas. (this is only open to US residents, if this is not a possibility please let me know) I know you are not in the US but wondered if you would be interested in offering to your US readers. Love the pink stuff! And Love, love, love that red polka dot w/red and green setting. Everything is SO pretty! Your home is so beautiful. Love that you set the table with items you already had. Hard to imagine things are warming up for you, but what an interesting and wonderful Christmas feel it makes with every thing so light and airy. Very pretty. Thanks for sharing this amazing post in the party. Pinning and tweeting it. What beautiful tablescape ideas! You did a very nice job on yours. I love the little stars and wreaths on the stems of the glassware. My favorite of the pinterest tablescapes are the cute little snowmen and gumdrop tree. Love how that all looks together. So whimsical! The others are of course very beautiful. Your home looks lovely. Have a wonderful weekend! Thanks for sharing so many great tablescapes! Have a great weekend Natasha! Love all your pink! Great pinspirations for the holiday table and really like what you did with yours. Happy Pinning and Merry Christmas! SO much inspiration!! However, I must admit that my favorite was your table with your blue and white plates. My Christmas table has always been blue and white. I love your pins and I love your Christmas decorating. Where did you get the Santas from that you have nexk to your kettle? OOhh! I LOVE the baubles on the tiered sandwich platter. What a great way to show off the colours that didn't make it to the tree this year! Here I am again for the party and linking! I hope you like the picture cause that was my last year x-mas table. Happy Holidays and Happy Pink Saturday, my sweet Natasha. Everything in your home is looking so pretty and festive. I love your tablescape! Your dishes are gorgeous, and I always love charms on my stemware during the holidays. Love the pins this week Natasha! you provide a lot o great inspirations. Thank you for hosting this party and for sharing all those pretty photos. OK, I have my Christmas Party linky post up...not sure when you will be linking but I'll ck back with you in a couple of hours. Lovely photo of you and your family. I love your beautiful colors in your dining room and the adorable santa station in the kitchen. Birthday wishes to Johnny! My fist time to link up with you. Thanks for hosting. Many lovely ideas for Chistmas table!! So much inspiration! Your table is beautiful with the Spode! Love it! Are your crackers by Robin Reed? I found some of those new in the box here in the states. I was going to do a post about them. Thank you for joining me for Home Sweet Home! I'm joining your party with a Christmas tablescape. I hope I'm doing it right! Love your tablescape, just beautiful! Your family is lovely. And you are right there is nothing better than making great memories together! I love your style my friend! Hope that you are enjoying the season and everything that it represents! Love the decorated branches on the tablescape! Everything is so beautiful! Your decor and the inspiration photos! Happy to be able to get in on the party, thanks for hosting Natasha! Love your table setting. Your blue dishes are fantastic!! Love it! So beautiful! Love all the inspiration, too! How in the world was I not already following you!?!? I took care of that!!! So lovely! So many ideas!! I love the little votives you but on your table. Thanks for sharing on the Take it on Tuesday blog hop! Natasha I have seen so many gorgeous and inspirational designs for holiday tables!! So fun! Do come and enter my 12 Days of Holiday Giveaways, many are sponsored by our blog friends!! Your house is gorgeous at Christmas time. My favorite of your pins is the Red and White Polka Dot one. I love that! Thanks for linking up to my Wednesday Pinterest Favorites. 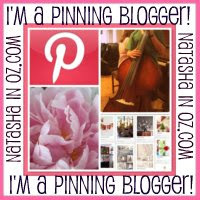 Natasha, you always have the best pins! I've re-pinned my favorites!